I've come across these in the past, and picked them up for the local shop a few times. Usually they have sweet traditional painted details on them - irresistible. 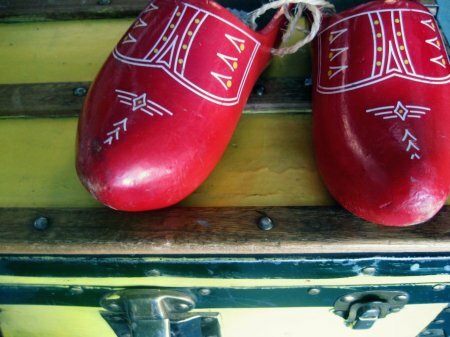 Dutch clogs are still in use across the ocean for trugging around the muddy garden. Much cuter than crocks, lined up in a row. 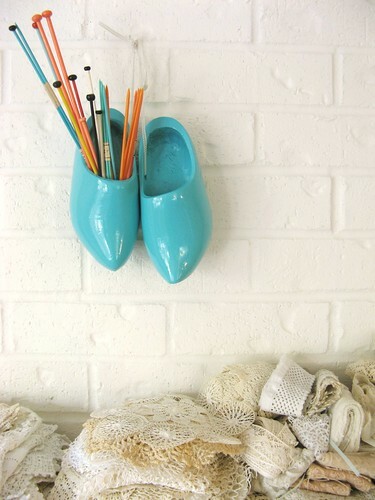 Tiff over at Dottie Angel embraced even the blandest pair of clogs by spray painting, drilling a little hole at the heel, and stringing them up like little wall pockets for her needles. 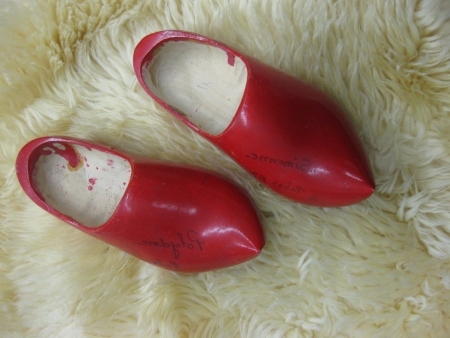 When i spotted these red souvenir clogs with a bland paint job for $2.99, I snapped em up with a glossy white re-paint in mind. Thanks for the cute idea Tiff! PS. Indie Business 2.0 - Starting, Surviving, & Succeeding is getting ready to launch this coming Monday! Check back for full details then!